"His Majesty - The Tree"
A wall calendar with original quilt designs by Piecemakers on every page as well as scriptures and whimsical watercolor paintings. A complete pattern book to make the quilt is included. It contains yardage requirements, full size patterns for applique, complete directions for Victorian style crazy patch, ribbon and thread embroidery patterns for embellishing the quilt blocks, plus detailed instructions for applique, embroidery, beading, and assembly of the cover quilt. 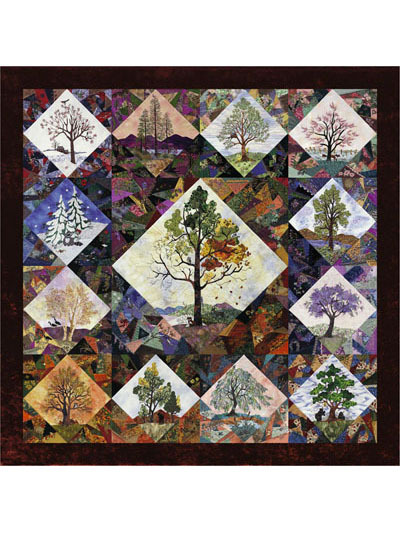 The theme for 2002 is trees and the title of the quilt is "His Majesty - the Tree". Finished quilt is 85" x 85".